Inversion tables, previously only found in medical and physical therapy offices, are now widely available for home use. They are essentially padded boards with a central axis mounted on a sturdy frame, allowing the table to tilt horizontally and vertically. The patient lies back on the table and becomes inverted, creating an anti-gravity effect on the body. Spinal traction is achieved by strapping the body onto the inversion table with ankle or other body straps, and/or anti-gravity boots, then tilting the table backward so the body is varying degrees of being inverted. Inversion can be slight or completely upside down. 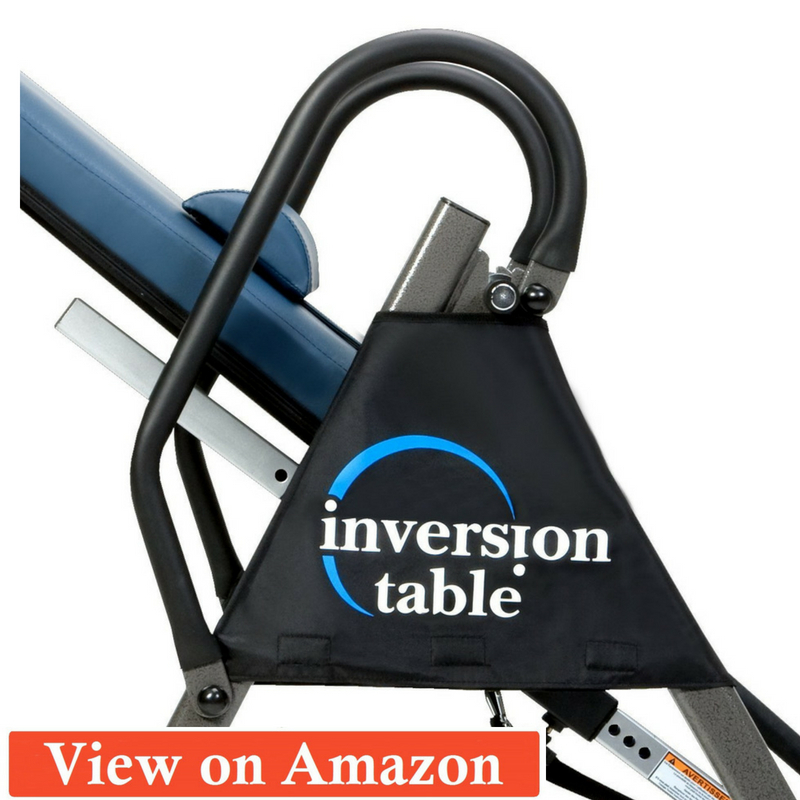 Inversion tables reviews here discuss the equipment created for inversion therapy, a type of physical therapy beneficial to those with back injuries or back discomfort through spinal decompression. The idea is that by removing the weight of the upper body that compresses the spine, the body’s skeleton can return to a properly aligned state. This state cannot be achieved by doing handstands as that kind of gymnastic activity would require a lot of muscle contraction throughout the arms, shoulders, back, and legs. The way to truly relax and stretch the spine, back muscles, hips, and legs is to remove the gravitational force and allow the body to relax without any requirement of muscle exertion. Innova ITM4800 300 lbs 120-180 deg. Relief from lower back pain as the weight of the upper body is forced away from the lumbar region of the spine. The lumbar region (those vertebrae in the small of your back) are the most impacted by the weight of the upper body, causing countless surgeries and therapy sessions when a disc (the tissue between vertebrae) becomes crushed between vertebrae or pushed out of position. This is a very painful condition that limits daily activity and truly has an effect on quality of life. Use of inversion tables can reduce the use of painkillers and anti-inflammatory drugs while improving the daily life of lower back pain sufferers. Inversion table reviews frequently praise the relief from pain utilizing this therapy. Decompression of vertebrae, allowing vertebrae to straighten into its natural position. Quite a lot of back pain is caused by a spine that is out of proper alignment. In a chiropractor’s office, the first thing they will do is check the alignment of the spine. After several weeks of costly adjustment sessions, there may be some relief from the misaligned spine as the doctor manually moves the vertebrae. Inversion tables can save the frequent trips to the chiropractor with a few minutes of daily inversion therapy. Relief from herniated disc pain by allowing the spine to open and discs to realign in the disc space. When the spine is misaligned, the vertebrae are also misaligned, causing the disc tissue (which act as cushions between the vertebrae) to become compressed or slip out of position. Inversion therapy stretches the spine to its original position with spaces between so the discs can go back into their natural position, cushioning the bones in the spine from rubbing against one another. Relaxation of back muscles due to anti-gravity. The only way to truly relax the large muscle bands in the back and shoulders is to relieve them from duty. Sitting upright, standing, and walking require great muscular strength. Even while lying down or sleeping it is difficult to completely relax the back muscles. Being inverted allows the body to use gravity to its advantage instead of constantly working against it. The back completely relaxes, allowing muscle recovery. Relaxation of hip joints as the upper body is gently pulled away from the legs, allowing bones and joints to fall into proper alignment. The hips are another part of the body affected by the gravitational force and all of the weight of the upper body. Inversion allows the weight to be gently lifted from the hips, allowing hip flexors to relax and muscle tissues to elongate, relieving hip joint and muscle pain. Lessened daily pain from back injuries or muscular strains. Many inversion table therapy users turn to prescription or over the counter muscle relaxers to recover from a back injury or pulled muscle. These are temporary bandaids for a real problem. By inverting the body, the pain is relieved by allowing the muscles holding up the spine to completely relax and stretch in a way that cannot be achieved by any other methods. Increased flexibility in back, legs, hips, neck, and shoulders. As the muscles, bones, and joints of the body are allowed to relax and stretch, more flexibility can be achieved. Incorporating inversion into a daily yoga or pilates routine can have amazing benefits in increased flexibility. Relief of headaches caused by pinched nerves. Many headaches and migraines can be caused by a nerve becoming pinched between vertebrae. Inversion therapy allows the spine to stretch, restoring the correct spacing between vertebrae, and allowing the nerves of the spinal cord to move back into their correct alignment in the central canal space of the vertebrae. 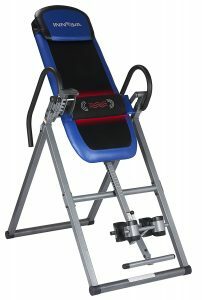 The trusted Ironman brand brings us yet another quality product in the Gravity 4000 Inversion Table. Its list of features and quality materials add up to a great value. This inversion table is created to comfortably and securely hold up a person weighing up to 350 pounds – great for all body types to overcome worries of stability during use. Made of quality foam, tubular steel, and strong PVC, the Gravity 4000 measures 26” x 26” x 49” and folds for storage between therapy sessions. It features a powder-coated finish tubular steel frame with rugged non-skid stabilizing feet designed to prevent movement during use, adding to the stability of the wide base. The high-quality nylon covered backrest is cushioned in memory foam for ultimate comfort during use, wipes clean easily, and inverts to a full 180 degree position. Safety handles on both sides help you securely return to an upright position. Although the product is heavy (as would be expected for a product that can hold a 350lb person), it is easy to assemble in just a few minutes and easy to use. Users found that this table is comfortable, easy to assemble, and sturdy. Though it can fold fairly flat for storage, the weight is rather cumbersome for moving by only one person. Ergonomic molded ankle cushions means less strain on ankles and no need for purchasing any additional equipment, such as anti-gravity boots. Adjustable leg post allows focus on the correct back positioning on the table for people of all heights, up to 6’6” tall. Large, extra long. Foam covered safety handles can be reached from any position. Heavy at 75 pounds, meaning some users might not be able to take advantage of the foldable feature without help, especially if they have a back injury. 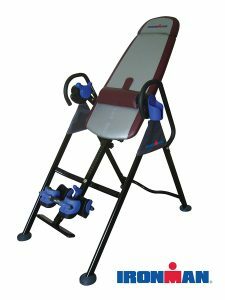 The Innova ITX9600 Heavy Duty Inversion Therapy Table is brought to the market by Innova Health and Fitness, well known for quality products to enhance your home fitness routine and meet your health goals. The ITX9600 introduces an adjustable padded headrest for your comfort and a large padded backrest. The backrest and headrest have a soft curvature which not only adds a pleasing design, it allows for freer movement of your arms. The innovative protective covering is pending patent with a goal of preventing pinched fingers in the adjustment pins. With a five position adjustable safety pin system, you simply set the angle of inversion you prefer and the table will stop when you reach the preferred inversion angle. The true balance system helps you feel secure at every point in the inversion process and features an ergonomic ankle system comprised of cushioned foam rollers. The ITX9600 holds a person 4’10” to 6’6” tall and weighing up to 300 pounds. The table itself is 46 x 28 x 63 inches, weighs 52 pounds, and folds for storage between uses. Users found this table easy to assemble and use, comfortable and stable feeling, and fairly easy to move with only one person. 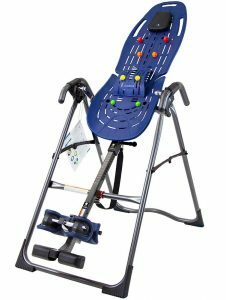 The Teeter Inversion Table with Back Pain Relief Kit takes inversion therapy to an entirely new level with acupressure point nodes for added pain relief. The acupressure nodes can be adjusted for varying levels of pressure or removed entirely. The ergonomic mesh table back provides lumbar support and airflow to keep you comfortable during your therapy while the flexible design molds to your body shape, relieving awkward pressure points found on some tables. 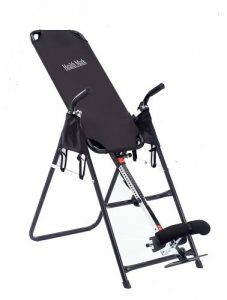 This is one of the most unique inversion tables on the market with an extended handle for locking the ankle mechanism in place – particularly helpful for those who cannot bend over very far. Traction handles on the bottom of the table allow the user to comfortable grip the table for stability, comfort, and extra stretching. The Teeter is the first FDA approved inversion table cleared as a Class 1 medical device and is usable by people 4’8” to 6’6” and up to 300 pounds. Advanced safety features including locking pins, cam locks, pivot bearings, and rubberized footing. Acupressure nodes may not be in the right places on all body types, but they can be adjusted to achieve more or less pressure. At around $460, this is one of the most expensive inversion tables. The Health Mark Pro is a no frills inversion table that gets the job done. 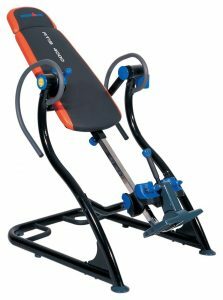 Don’t be fooled by the basic look of this model – the strong tubular steel construction makes for a sturdy, stable piece of equipment that really will help get you on your way to a pain free back. The unique back board is made of super strong nylon, instead of the padded board of most tables on the market, for a breathable experience with no pressure on any part of your back and features comfortable, secure ankle locks. The Health Mark is designed to be a hang-free experience without added features that increase the price. It will hold any person from 4’8” to 6’6” and up to 300 pounds. Backrest does not lock in place in the inverted position, so no additional exercises (such as abdominal and oblique crunches) can be performed during use. The swinging motion may be uncomfortable for some users. Very short handles require user to utilize arms and abdominal muscles to return to upright position, which may be difficult for some users who will require assistance in returning to an upright position. This Ironman model has a wide, sturdy frame with handles on the base of the frame for support and stability while in the inverted position. It is both stylish and heavy duty with a thick memory foam backboard and long, curved safety handles for ease in returning to a fully upright position without assistance. The padded ankle boots will hold the user securely while the locking mechanism allows ten different inversion grades. 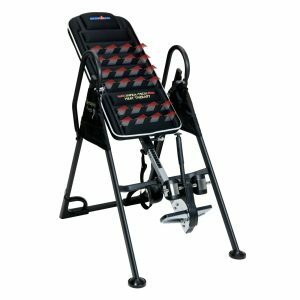 This Ironman model is both inversion table and core exercise equipment for a full upper body therapy and exercise routine. The Ironman ATIS 4000 inversion table is designed to allow rigorous abdominal crunches in an inverted position, allowing nothing but your own body weight to be used for resistance. With a height limit of 6’6” and a weight limit of 320 pounds, this piece of therapy/exercise equipment is great for all body types. This unit is extremely heavy. Weighing in at a whopping 111 pounds, most users will require assistance to assemble. This unit is not designed to be easy to move. No folding capability means you need an open, dedicated area for permanent use, such as a home gym, basement, or garage area. This Teeter inversion table is pretty much the same as the first one reviewed with fewer bells and whistles. Still having the innovative design features loved in the Teeter table, such as flexible back board, breathable material, acupressure nodes, and classification as an FDA approved medical device, there is a bit of savings in this model if things like additional locking positions and long handles are not necessary. This model also lacks the extended locking mechanism for the ankle straps, so the user will have to be able to reach the ankle straps from an upright position. If these features are not needed, the rest of the table is the same concept – ergonomic shaping, vented, flexible backboard, acupressure nodes, and a comfortable head rest are all part of the package. Comfortable with flexible backboard and superior breathability. Short handles mean more strain on the arms, back, and abdominals to return to an upright position, or help required by another person. No extended locking mechanism requires the user to have a full range of motion to be able to bend over to strap in ankles or have assistance from another person. This Ironman model features ten different locking inversion angles for every user and need. The locking mechanism allows the Ironman LXT850 to be used for inverted abdominal exercise in addition to inversion therapy. The many different locking positions are helpful for a person who may be fearful of the inversion therapy so they can start with a slight angel and continue as they become more comfortable. One unique feature of this particular table is the ability to lock it in place while in an upright position, which is helpful in preventing the fear of flipping over while getting in place. This table holds users up to 300 pounds. This unit is very heavy at 82 pounds, so assistance will be required to assemble and move. Construction of the base is slightly different than most models with four legs instead of two tubular pieces, which may lead to some side to side movement that could create an unsteady feeling when doing oblique abdominal exercises. The Ironman IFT 4000 Infrared Inversion Table has a well-padded, molded backrest with lumbar support and embedded infrared fibers that provide gentle heat during your inversion therapy for added pain relief, muscle relaxation, and circulation. It includes a remote control for the adjustable heat feature and a pocket to keep it within reach during use. This table also has ratcheting ankle lock system with an extended handle that is super easy to use, even for users who cannot reach the ankle locks from an upright position. Handles on the sturdy tubular base of the table provide solid stability while inverted, and extra long side handles aid the user in returning to an upright position without assistance. The table has three inversion angles and is sturdy enough to accommodates users up to 350 pounds. The Ironman iControl Inversion Table brings to the market an innovative angle locking system that is hand controlled, allowing the back board to be locked at any angle. Simply lean back and pull on the hand brake and the table will safely lock into position. Extra comfortable padding and head rest supply ultimate comfort during use. This table features long comfort foam covered handlebars for ease in returning to an upright position without assistance, and a cup shaped holder for keeping your cell phone, tv remote control, or bottle of water conveniently close by. The Ironman iControl has a unique stretcher bar for really getting a full muscular stretch while inverted and can be safely used for inverted abdominal exercises such as inverted crunches and reverse crunches. This table weighs 62 pounds, folds nearly flat for storage, and can hold up to 275 pounds. Locks at any angle with an easy hand brake system while in use, allowing you to adjust your position without returning to an upright position. Safe for inverted abdominal exercise with locking mechanism able to engage at any angle. Lack of lumbar support may be uncomfortable for some users trying to achieve proper spinal alignment or with lumbar injuries. The Innova ITM4800 Advanced Therapeutic Inversion Therapy Table has taken the idea of inversion therapy two steps forward by adding a removable and adjustable lumbar cushion with heat and vibrating massage. You can enjoy the relief of inversion therapy while getting a lumbar massage with penetrating heat! The thick, padded backrest provides ample cushioning for supreme comfort and has five adjustable locking positions for varied inversion angles. Locking positions allow for abdominal exercises. Also featured are long, foam padded handles for ease in returning to the upright position. This unit folds for upright storage and weighs only 57 pounds for easier portability. It can accommodate users up to 6’6” and 300 pounds. 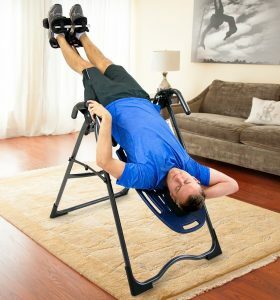 First and foremost, as should be stated in all inversion table reviews, it is important to talk to your doctor before starting any kind of exercise or therapy. An inversion table allows you to basically hang upside down, or at a selection of angles between upright and fully inverted. The purpose of inversion therapy is to remove all of the weight and pressure off of the back and allow the spine to realign itself. When properly aligned, the discs between the vertebrae can perform their proper function of preventing the vertebrae from rubbing against each other and pinching nerves in the spinal cord. 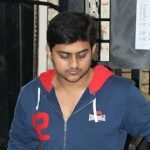 Using the table for even just a few minutes a day can yield amazing results to sufferers of back pain. For proper use, your table should be on a secure floor. Carpet is okay but rugs are not safe as they can move. When installing on a hard surface, such as wood or tile, be sure the table has proper rubber gripping on the bottom and will not slide around on the hard floor. Beginners should have another person available to help with inversion and uprighting the first few uses, until you are comfortable with the procedure. Be sure you are wearing comfortable socks and shoes, as these help with the ankle locking mechanism. You should practice securing your ankles into the ankle locks until you find a comfortable position – this should be as tight as possible so you don’t slip out. Most inversion table reviews say this is the part of inversion therapy that takes the most getting used to. If your table has adjustment pins, you should place the pin before you begin. All it takes to enter the inverted position is simply raising your arms over your head and allowing your body weight to shift. The table will tilt backward and stop at the predetermined position (if you have a locking table). On tables that go a full 180 degrees without locking, you will quickly find yourself in the inverted position. Maintain your inverted position for as long as you feel comfortable. If at any point you feel pain, dizziness, light headedness, or panic, stop the session and return to the upright position. Most users say 1-4 minutes at a time is about all one can do. If you are using your table for inverted abdominal exercise, you should seek the advice of an expert to fully understand how to properly perform the exercises to prevent injury and maximize effectiveness. Also, be sure your table has the capabilities to perform such exercises. When is an Inversion Therapy Table Not For You? As stated in the inversion table reviews, you should seek advice from your doctor before beginning any exercise or therapy program. You should not use an inversion table if you are pregnant, have high blood pressure or hypertension, or if you are taking blood thinners. If you have experienced a heart attack or stroke or have a pacemaker you should avoid inversion therapy. You should be aware that pressure on the eyes, ears, and sinuses is increased while inverted. If you have any kinds of problems with vision, your inner ears, or chronic sinus pressure you should not use inversion therapy. In fact, being inverted when you have eye problems such as glaucoma or retinal detachment can actually cause eye bleeding and blindness, so please avoid this activity. Finally, if you have a hernia, have had hernia or other surgeries, or have had any kind of fracture or osteoporosis, you need to be cleared by a doctor for inversion therapy. Share these inversion table reviews with your doctor to aid in making a decision. First and foremost, you should decide what you will use it for and where you will put it. As shown in the inversion table reviews, some models are lightweight and fold for storage, others need a more permanent place as they are heavy and either hard to move or do not fold. If you only have a small space, you will need a more compact table, but if you have the room for it in your home gym, basement, or a spare room, then you don’t need to be concerned about size. If you simply want to hang upside down, then any inversion table will do. If you want to start off slowly and experiment with different angles, you need to look for a fully adjustable table. If your goal is not only inversion but the ability to perform abdominal exercises, then you need a sturdy table with a wide frame that locks into position. Decide which features you can’t live without and which are just nice extras. 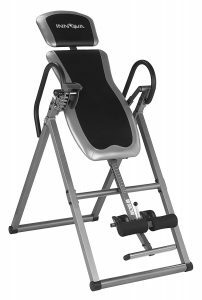 The inversion table reviews give an extensive list of features to compare. If you have problems reaching your feet, for example, you will need a table that has an extended locking mechanism for easy reaching. If you are trying to address lumbar issues, then you may prefer a table with lumbar support, but if your goal is simply inversion you obviously don’t need a table with massage and heat. All tables must have secure footing, safety handles, and adequate support for your body size. Inversion therapy can be an amazing way to relieve back pain and pressure without having to leave your home or pay for expensive physical therapy sessions. Inversion therapy is easy enough to do at home in just a few minutes a day without any special training or difficult routine to learn. Simply strap your ankles into secure ankle grips, raise your arms above your head, and just lie back, allowing gravity to do all of the work. There are many table options to choose from in today’s market that is teeming with home gym equipment, so it is very wise to take the time to look at all of the features side by side to make a fully informed decision. Don’t let price or features be your only guidelines! Be sure you are getting the features you need in a price range you can afford, but don’t sacrifice features for price. All of the tables reviewed here meet safety and quality guidelines so you can be sure any one of these will be a good choice. Always talk to a doctor before beginning any new therapy or exercise routine, and stop if something doesn’t feel right. as soon as possible.Thanks for your information.